Three of Brazil's leading clubs have said they will offer players to Chapecoense, after the majority of their squad died in a plane crash. They were travelling to play in the Copa Sudamericana final first leg, and opponents Atletico Nacional have asked for Chapecoense to be awarded the cup. Flamengo, Palmeiras and Sao Paulo are the clubs to have offered help. Sao Paulo, who have won six national titles, also said Chapecoense should be exempt from relegation to Brazilian football's second tier for the next three seasons as they attempt to rebuild the club. Six of the 77 people aboard the plane survived the crash, which was blamed on an electrical fault. 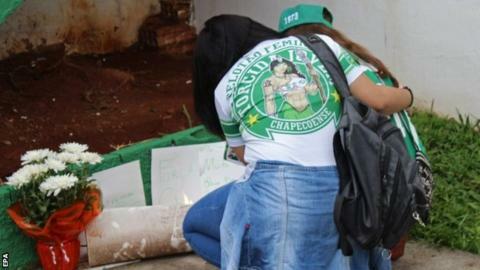 A statement by Fox Sports Latin America said that six employees from its Brazil operation died in the crash. In the aftermath of the 1958 Munich air disaster, both Liverpool and Nottingham Forest offered to loan players to Manchester United, and players from non-league Bishop Auckland featured for the Red Devils. The tweet from Atletico Nacional translates as "Atletico Nacional asks Conmebol that the title of the South American be given to Chapecoense"